As Amsterdam pulled away to begin my seven-night cruise to Alaska, there was no better place to watch the downtown Seattle skyline fade away than from the comfort of one of the ship's classic teak lounge chairs, glass of Champagne in hand. 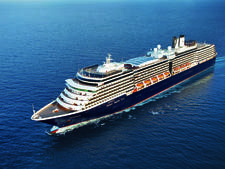 After all, isn't sailing on Holland America, and Amsterdam to boot, all about reveling in the storied traditions of cruising? 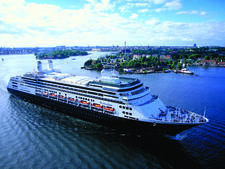 From a perch on the lower promenade deck, as some of the more ambitious fellow passengers walk pre-dinner laps on the open-air deck, it was obvious that HAL's long-standing oceangoing traditions have been blended with modern amenities and services. 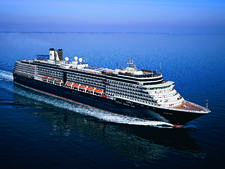 As part of its Signature of Excellence program, Holland America has committed to pouring more than a half a billion dollars into its fleet of 13 ships since 2003, upgrading staterooms, public spaces and shore excursions. Amsterdam showcases how the line has fused the old with new. 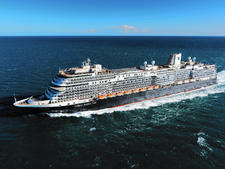 Take the ship's multi-million-dollar art and antiques collection. It can now be explored with the help of an iPod audio tour. A pre-dinner drink in the Explorer's Lounge, made all the more sweet by the music of a classical quartet, can cap an afternoon spent getting a 75-minute hot stone massage at the Greenhouse Spa or watching a cooking demonstration at the Culinary Arts Center. That couple you passed on formal night decked out in their best black-tie attire? They spent part of the day learning to blog at an onboard digital workshop. 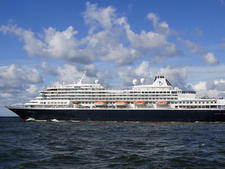 Along with newer amenities, Amsterdam has a certain regal note. 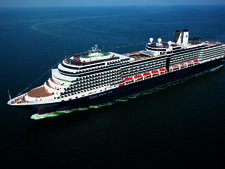 Passengers on Holland America still have the option for a set-seating dining, though open-seating is also available. The ship maintains the tradition of serving mugs of warm Dutch pea soup on deck to bundled-up, glacier-gazing travelers. And the decor in many of the public spaces is anything but understated. An ornate clock in the three-level atrium is as much a towering piece of art as it is a way to get the current time around the world. 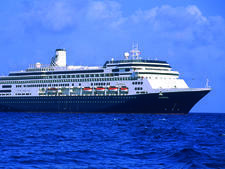 It's one of the first features you'll glimpse on the ship, and as you pass by it during your trip, it's a reminder that Holland America hasn't forgotten its roots. 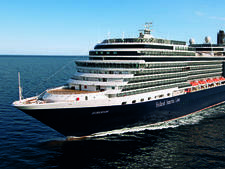 Size-wise, Amsterdam, which spends summers in Alaska and the remainder of the year sailing a world cruise and extended journeys in Australia and the South Pacific, is solidly in the middle of the Holland America fleet. 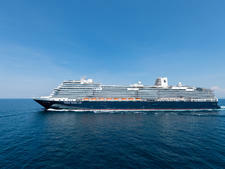 Built in 2000, it's smaller than the line's Vista and Signature classes of ships and carries 700 fewer passengers than Eurodam, the largest ship in the lineup. 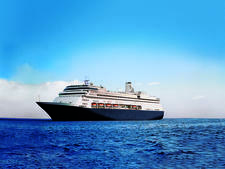 Even on a full cruise, the ship rarely feels crowded, except for the lunch rush at the casual Lido Restaurant on sea days and the occasional, fast-moving line in the La Fontaine main dining room. The Sea View pool, aft of the Lido Deck, is a quiet retreat that feels like a private oasis. Sure, you won't exactly find swimsuit weather en route to Juneau, but staffers graciously offer the perfect Alaska sunbathing accessory: a red wool blanket. 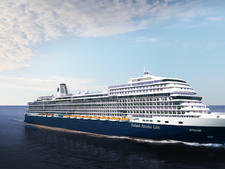 Amsterdam continues to get small upgrades but is not, at this point, in line to receive the whole Signature of Excellence package. 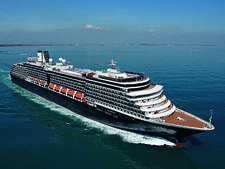 So, while it recently received Canaletto, Holland America's take on a casual Italian eatery, it will not be outfitted with spa cabins, an adults-only pool area or a new bar concept called Mix. That said, perhaps the ship doesn't even need these latest bells and whistles. 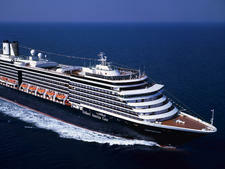 On a recent seven-night Alaska Explorer cruise, the majority of passengers were in the 50-plus range. There were also a smattering of young families with small children as well as multi-generational groups of grown children traveling with one or both parents. 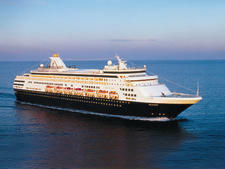 According to a Holland American spokesman, passengers on Alaska cruises skew older than those on Caribbean itineraries. Attire during the day is casual, and on a recent cruise to Alaska, jeans and khaki pants were standard. 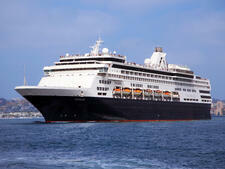 Days in port saw passengers in even more casual sportswear and hiking shoes. Two evenings were designated formal, and while some passengers donned cocktail dresses, gowns, tuxedos and suits, others chose to opt out of the evening code altogether and stick to jeans or khakis. The remaining evenings called for smart-casual attire. Translation: No jeans were allowed. Passengers in the Pinnacle Grill and main dining room abided by the guidelines, but more casual attire was seen in the Lido restaurant and Canaletto. The automatic tip for passengers staying in interior, oceanview and verandah cabins is $14.50 per person, per day. Passengers in suites will be charged $16 per person, per day.